The moment you are involved in a semi-truck accident you are at a disadvantage. By hiring an experienced trucking accident lawyer you can negate some of this, but the reality is the trucking company responsible for the accident holds a very strong hand to begin with. There are two main reasons why trucking companies have the playing field tilted in their favor. 1. Money: Semi-truck accidents can cause millions of dollars in damages. Trucking companies oftentimes retain a team of high-priced defense attorneys to aggressively defend themselves. Even if the company isn’t innocent, being “less guilty” justifies those attorney fees. 2. Timing: Painting themselves in favorable light sometimes begins an hour or two after the accident occurs. Trucking companies will often send a team of investigators and lawyers to the scene of the crash before a victim can mentally process the incident. The evidence of the crash is vital to a trucking company’s case, and securing it and skewing it in their favor happens right after an accident. When someone is involved in a trucking accident, the road ahead seems daunting. Medical bills are often through the roof, they’ve missed extended periods of work and there’s a feeling of helplessness that sets in. Because of these things, some people believe it best to just settle quickly with the trucking company without hiring a lawyer. 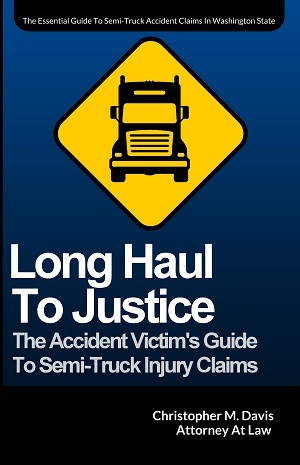 It’s not hard to see how accident victims and their families are behind the eight ball in semi-truck accident cases. The trucking company has likely already created an accident scenario favorable to themselves, which impacts your settlement. For that reason, hiring an experienced truck accident attorney is crucial. The right lawyer will basically start the case from scratch, delving into all details of the accident scene, the trucking company and the driver. By speaking to the witnesses again and obtaining a semi-truck’s “Blackbox,” a different picture – one more favorable to the victim – may begin to form. The Seattle-based truck accident lawyers at Davis Law Group, P.S., are well-versed in the state and federal laws governing semi-truck accident injuries, including the Federal Motor Carrier Safety Administration regulations. Attorney Chris Davis has access to a network of experts in accident reconstruction, medicine and other fields who will provide an honest evaluation of the case. If you or someone you love has been seriously injured in an accident with a semi-truck, contact Davis Law Group today. You may have a cause of action against the driver, their insurance company, or the manufacturer, owner, or operator of the commercial vehicle involved. Call (206) 727-4000 if you or a loved one has been involved in a semi-truck accident. You can also fill out the case evaluation form on this page or use the chat feature below.